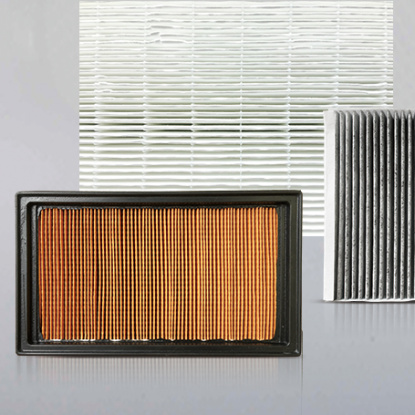 Air filter can be classified as low efficiency, medium efficiency, and high efficiency filters. The applications can be on household AC, air filtration, vacuum cleaner, industrial AC, dust free room, dust free workshop, medical grade filter, motor vehicle filter, and engine filter. Fast setting time, outstanding bonding strength, and good operability, suitability for fast production, are the properties that belong to hot melt adhesives, which is the best selection for air filter productions. Hot melt adhesives assist filter shaping, and can be applied on filter pleating, filter, assembly, cap fixing and bonding, hollow fiber stuffing, bonding two sides of filtration media, bag stiche, and sealing of stitched holes. Tex Year tailors suitable hot melt adhesives for filters on the basis of production speeds, pleat numbers, and filtration media, which could be glass fiber, PET, PTFE, PP, paper, etc… We make sure the distance between each pleat is fixed, satisfy the demands of heat resistance & cold resistance, and offer good bonding strength, low shrinkage rate, which will not allow product deformation. Fix the distance between each pleat by offering different glues for different production speed, different pleat numbers, and different filtration media. Good bonding strength to metal frame, filtration media and paper frame, suitable for filter frame assembly. Good cohesion, 90℃ resistant, oil resistant. Workable for heat resistant auto AC filter side pasting. Oil resistant, heat resistant, aging resistant, chemical resistant, good cohesion, flexible, bendable, stretchable, good shaping. Workable for auto AC filter, air filter pleating, air filter frame assembly.